I feel guilty even saying it, but I really do not particularly like Anemone cylindrica. It is a perfectly fine native plant, with a lovely mound of green leaves and interesting seed heads. It can grow in really, really dry shade. It is even easy to propagate from seed and can be transplanted mid-season without major trauma. So why don’t I just love it? Because the same can be said about Anemone virginiana, but A. virginiana has pretty flowers. Oh, A. cylindrica has interesting flowers, greenish white with the "petals" all curled up into little pointed triangles. But the real problem is that the two anemones look the same to the interested non-specialist, unless they are blooming. And I have spent many years (cumulative) caring for little seedlings only to find when they bloom that they are A. cylindrica. Off to the back 20 they go. Plant the new bunch that surely will be A. virginiana! These anemones are both commonly called thimbleweed, but I have seen A. virginiana called tall thimbleweed or tall anemone, versus candle anemone or long-head thimbleweed for A. cylindrica. To me, the "thimble" seed head is about the same length in both local species, but probably there are regional differences, and a glance at internet descriptions and images show a distribution. (Some even have fairly showy A. cylindrica!). But when I go to collect a bit of seed in the fall, I cannot distinguish the two. And the A. cylindrica that grows from my local collections is less than lovely. A. cylindrica (IWF1) - The stems are 1-2' tall. There is a whorl of long-stalked leaves at the base of the plant. A second whorl of leaves occurs higher up on the stem. The leaves are divided into 3-5 lobes and have dentate margins. A single greenish-white flower on a long stalk arises from each whorl of stem leaves. Scattered white hairs occur on both the leaves and their stalks. The flowers are ~¾" across with 5 petal-like sepals that "often fail to open fully". A small green cone in the center of the flowers develops into an elongated fruit that resembles a cylindrical green thimble up to 1½" long. According to IWF1, this thimble is at least twice as long as it is wide. The species has a long flowering period, blooming from early to mid-summer. In late fall the thimbles begin to break into cottony tufts that can last through the winter. This plant produces an allelopathic substance, protoanemonin, which inhibits seed germination and seedling growth of many species of plants. It is said that mammal herbivores usually avoid consumption of this species because the foliage is toxic, causing a burning sensation in the mouth and irritation of the gastrointestinal tract. However, the deer in my neighborhood are tough, and decimate the flower stalks of every clump outside the deer fence. They do avoid the leaves. 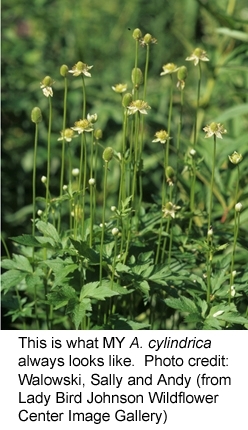 A. virginiana (IWF2) - The stems are 1-3 ¼' tall. The leaves and stems are as described for A. cylindrica except that in A. virginiana the stem leaves predominately occur in 2 whorls, with the lower whorl usually having 3 leaves and the upper whorl usually having 2 leaves. The leaf blades are up to 5" long & wide, and have long petioles, with scattered white hairs. Each major leaf blade is divided into 2 or 3 deep lobes, which are in turn divided into 2 or 3 shallower lobes. Because these divisions are rather sharp, the blades are cleft and the margins are coarsely serrate or dentate. A single flower, about ¾-1.5" across when fully open, occurs on the summit of long stalks that arise out of the upper whorl of stem leaves. The flowers have 5 white or greenish white sepals (looking like petals), and numerous stamens with yellow or light brown anthers. The green central head in the center of the flower becomes larger and more elongated as the sepals fall off. The "thimble" is ¾-1" long and up to ½" across, with seeds as described for A. cylindrica. This species also produces the allelopathic substance, protoanemonin. 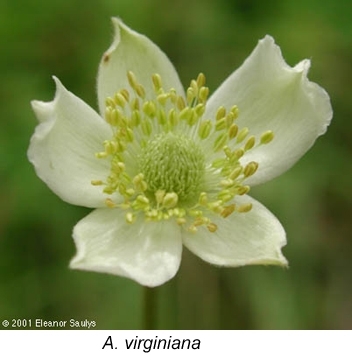 Comparison (IWF1&2): Anemone virginiana (& A. cylindrica) can be easily distinguished from Anemone canadensis (Canada Anemone), a somewhat similar local anemone, because its leaves have conspicuous petioles, while the leaves of the latter species are sessile or perfoliate. 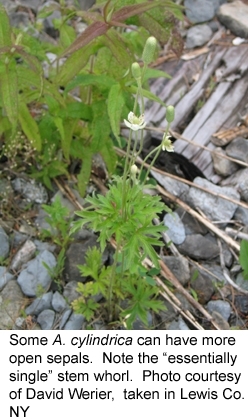 Canada anemone also grows in moister habitats. A. virginiana photos courtesy of Connecticut Botanical Society website.